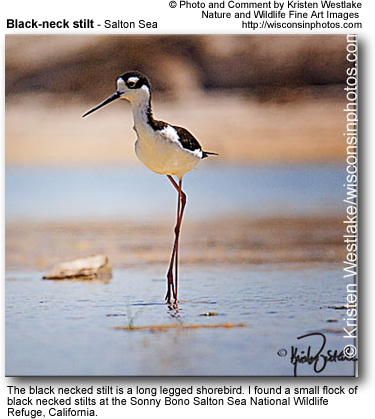 Stilts are waders in the same bird family as the avocets. They are found in brackish or saline wetlands in warm or hot climates. They have extremely long legs, hence the group name, and long thin bills. Stilts typically feed on aquatic insects and other small creatures and nest on the ground surface in loose colonies. A fossil stilt has been described as Himantopus olsoni, based on remains recovered in the Late Miocene Big Sandy Formation of Wickieup, USA.